Years ago, I was at a farmers market in Marblehead, MA with my aunt when I caught sight of a delicious looking thing. Wrapped in plastic foil were two oatmeal cookies with a generous amount of frosting sandwiched between them. The seller had labeled them “Whoopie pies”, which I later learned is an entirely different thing. When I returned to Marblehead a couple of years later, I went on a hunt to find this delicious “Whoopie pie” I had such fond memories of. I finally found it, sadly packaged in a plastic box in Whole Foods, and was tremendously disappointed to find it looked nothing like what I remembered, and tasted awful. 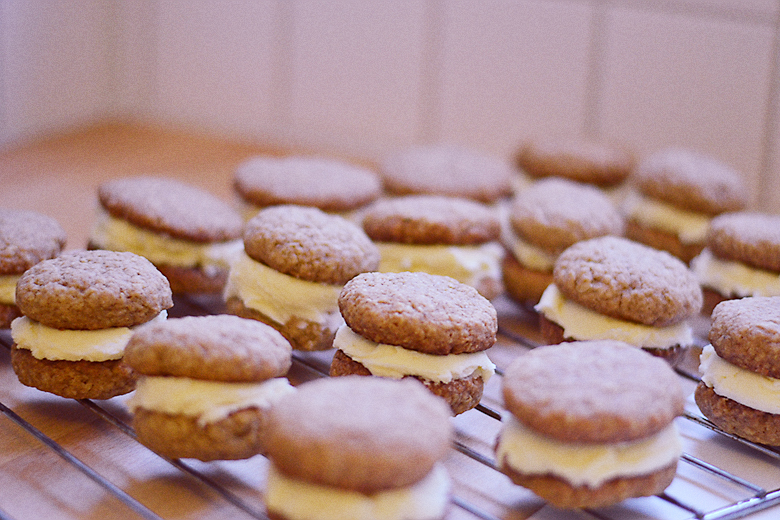 Turns out, Whoopie pies are not Oatmeal Creme Pies. 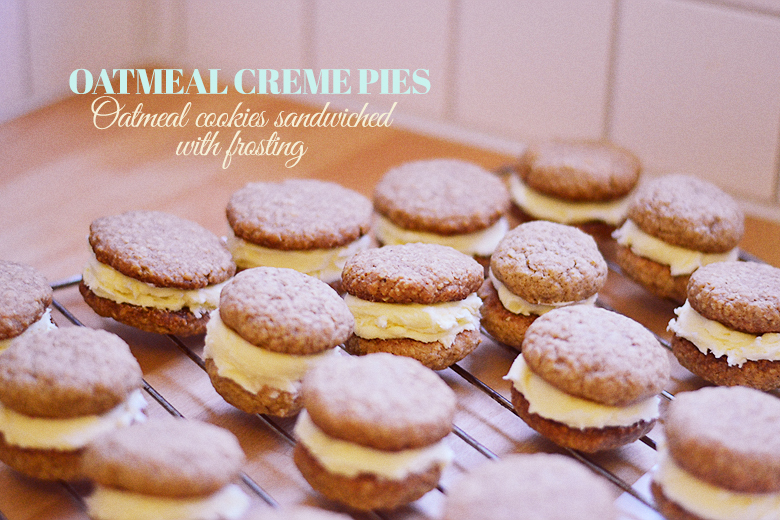 These are Oatmeal Creme Pies. And they might just be the best darn thing you’ll ever eat. Let’s go! 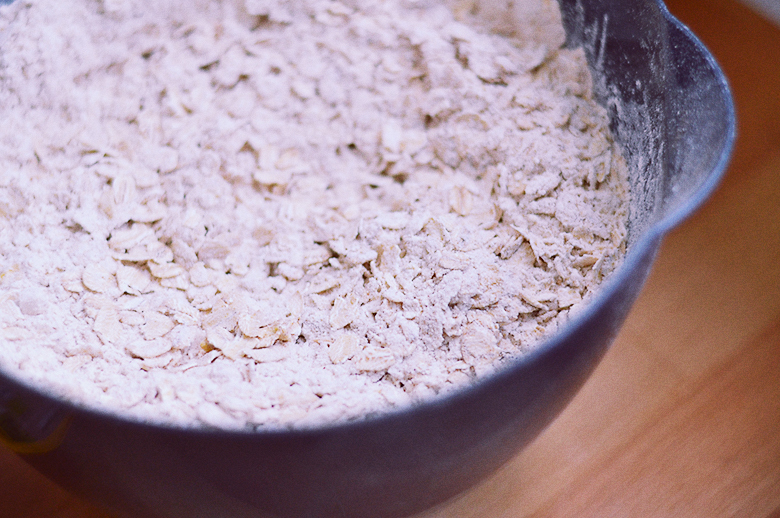 Mix flour, baking soda, oats, salt, cinnamon, and ginger in a medium sized bowl. Mix the sugars and butter until creamy. Add egg and vanilla extract. Combine the wet and dry ingredients, this will leave you with a thick and sticky dough. Now fire up the oven while you form the dough into little balls, pat them down a bit, and place them a couple of inches apart on a baking sheet. Once baked, let them cool for a couple of minutes on the baking sheet and then transfer them to a wire rack to cool completely. Whip up your frosting, this is the glue that holds your cookies together, a.k.a the crack. Make sure your cookies are completely cooled (I made my cookies a day ahead and stored them in an airtight container in the fridge, then frosted them cold). 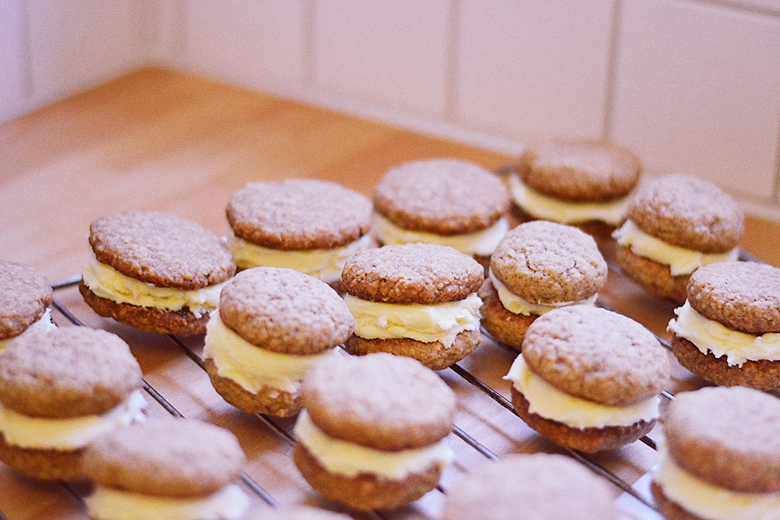 Spread frosting on the bottom of one cookie, sandwhich another on top, and voilá! I made these for Tom and his friends for their weekend ski trip. Wrap them in plastic foil to keep them deliciously moist and for easier transport to pick-nicks or potlucks. Set your oven to 375 F / 190 C / gas mark 5. 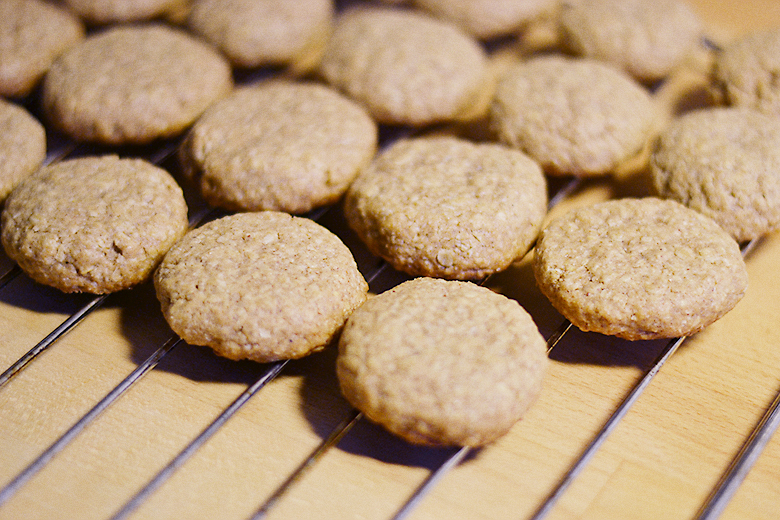 To make the oatmeal cookies: In a medium bowl, combine the flour, baking soda, salt, cinnamon, and ginger. Add the oats and mix until combined. Set aside. 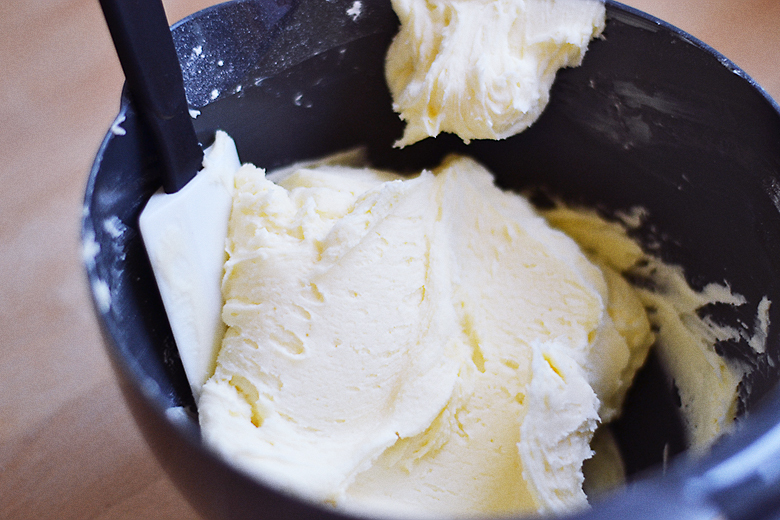 In a large bowl, mix the sugars and butter with an electric stand mixer until creamy. 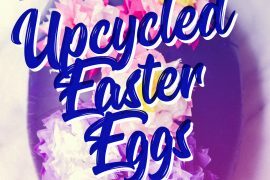 Add the egg and vanilla extract and mix again until combined. 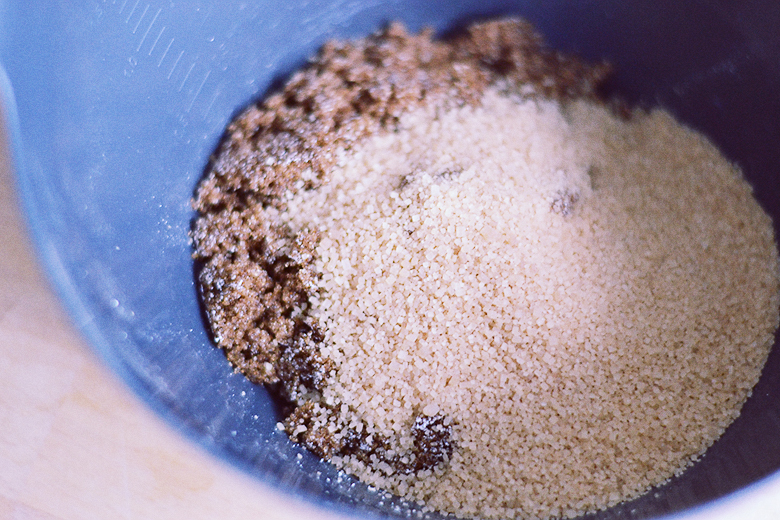 Using a spatula, slowly mix the dry ingredients with the wet, stirring until completely combined. Towards the end, I find it easier to use my hands to combine the dough as it gets very thick and sticky. Roll dough into balls (about 2 Tbs of dough for each cookie), pat them down slightly and place a couple of inches apart on a baking tray lined with parchment paper. 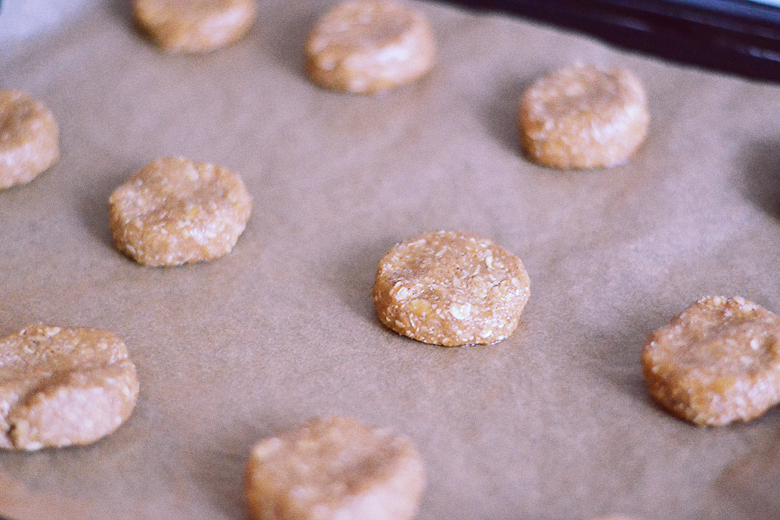 The cookies will puff up slightly so don’t make them too thick. Bake for about 10 minutes until slightly browned around the edges. Remove from oven and allow to cool on the baking tray for 3 minutes, then transfer to a wire rack to cool completely. To make the frosting: Cream the butter with an electric mixer on high for a couple of minutes, slowly add the powdered sugar and mix until combined. Add the cream, vanilla extract, and salt and mix until incorporated. Frost the bottom of one cooled (or chilled) cookie (be generous with the frosting, there’s plenty to go around), then sandwich a second cookie on top, bottom side touching the frosting. Wrap the cookies in plastic wrap to keep moist and fresh. Store in room temperature for up to 2 days or keep in the fridge to keep fresh longer. If storing in the fridge, make sure you take them out a couple of hours before serving so they warm to room temperature and are soft when serving.